Can I ask for tips/gratuity when customers buy a gift card? You sure can! 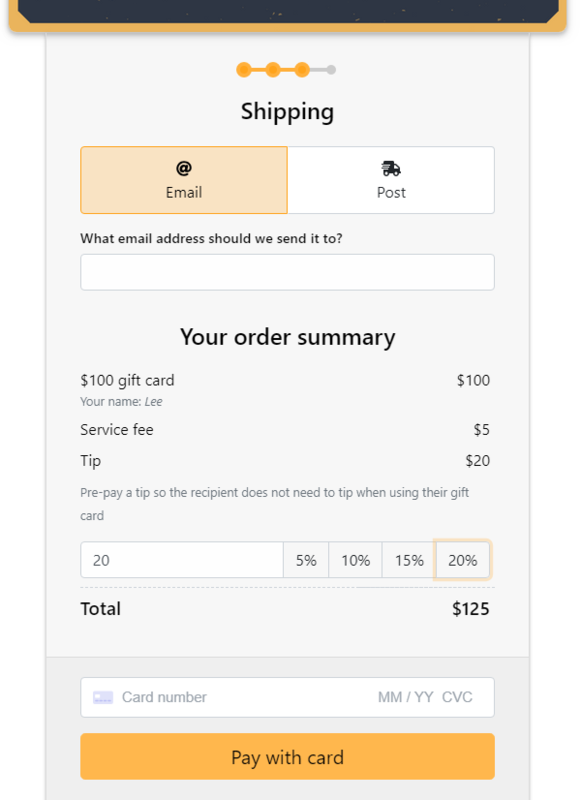 You can turn on an option (it's off by default) to ask your customers to pre-pay a tip when they buy a gift card for someone. When you turn it on we will give your customers the chance to pre-pay for a tip using some default percentages (5%, 10%, 15%, 20%) or a custom amount. Go to Settings > Checkout in your Gift Up! dashboard and turn on tips. How do tips affect things like emails etc...? We notify the recipient in their email that a tip has been included / pre-paid on their gift card, but we do not tell them the amount of tip. When you come to redeem the gift card using our mobile or web app in-store, you will also be told that a tip has been pre-paid, but again, not the tip value. When you look an order in your dashboard you will see if a tip has been added and what the tip value was.